The Pioneer PD-D9 Mk2 is instantly recognisable to anyone who ever saw the original D9, not least from the unusual front-panel design, but also from the display (which has actually changed slightly, being a different colour and rather easier to read off-axis) and the unusually small number of front-panel controls. Yes, you'll find just two buttons here. One opens and closes the tray, while the other alternates between Play and Stop. We complained about this last time and we'll say it again. No means of selecting tracks from the front panel is horribly, damnably irritating. Having no search facility is annoying enough, but it's so common we've got used to it. But needing a remote to find a track is beyond the pale. As you have to walk up to the player to insert a disc, you are likely to use front-panel buttons to start play. But quite often, you'll want to start by playing a track other than Track 1, so you might as well do that from the front panel, too. Minimalism is all very well, but not when it impedes handling. All right, enough whining. The player's build and specification is otherwise very good. It's a heavy unit, thanks in part to a reinforced base that should help reduce unwanted mechanical vibration. The sides and top are also strong and non-resonant. The transport is brisk and responsive for an SACD-type and reads discs in about eight seconds. Internally, there is a well-specified power supply with two R-core transformers, one for analogue and one for digital circuits, plus a much smaller standby transformer. There's also plenty of screening around to keep digital signals and mains hum out of harm's way. The digital outputs are placed alone on copper-plated screen between them and the audio parts. If that's not enough, you can switch them and the display off entirely with the 'Pure Audio' function engaged. The audio functions are achieved by an impressive array of recent integrated circuits, starting with a sample-rate converter chip, which upsamples CD audio to 176.4khz. Conversion to analogue is carried out using a pair of Wolfson's latest and highest performance parts, operating in parallel mode to give a small improvement in distortion and signal-to-noise ratio. 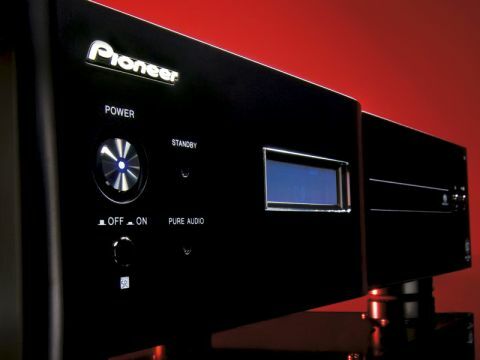 Analogue filtering and output buffering is done by high-grade op-amps, for which Pioneer has selected through-hole parts. All the others are only available as surface-mounted. Passive component quality is good, too with through-hole resistors in key positions and the power supply has been fitted with low noise Schottky rectifiers and unusually large reservoir capacitors. Pioneer's own slow roll off digital filtering scheme, 'Legato Link Pro', is included, but switchable. The alternative is a conventional near-brickwall filter.